Angus was born on September 21, 2012. 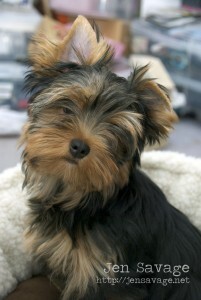 He’s a registered purebred Yorkshire Terrier. Angus is also micro chipped. I highly recommend micro chipping your dog or cat if you haven’t already done so. Angus also has pet insurance. It’s one of those, better safe than sorry things and I would encourage anyone with a pet to get insurance. We use Trupanion. Angus, like many Yorkies, has allergies. You can read more about this on the “Dogs With Allergies” page. Global Pet Foods: This is where I buy Angus’ food and treats. Angus eats Canine Caviar Leaping Spirit (previously called Wilderness). His treats are Orijen, normally we get the Alberta Bison but lately we haven’t been able to find that one in the store. The staff at this store is wonderful, friendly and extremely helpful. Pet Smart: Most often, this is where I go for clothes and toys for Angus. They also have a friendly staff and they have the best variety when it comes to clothes. Angus loves to wear shirts and pjs and of course, in the winter, sweaters and coats. I know some people mock those that put clothes on their dogs but we have some really cold temperatures here and they actually need a coat. It’s a misconception to think that just because a dog has fur they won’t be cold. And ultimately, who cares if someone wants to put clothes on their dog? It doesn’t hurt the dog and in Angus’ case, he likes it! I happen to think very highly of both Angus’ vet clinic and groomer so if you’re in Moncton and looking for a vet, check out Mountain Road Animal Hospital. If you’re looking for a groomer, why not go to the best? Angus loves his Peggy, the owner of Sharon’s Grooming Shoppe. I can’t say enough good things about Peggy. She is the best and there is no one I’d rather have grooming my dog. Angus actually has both a Buddy Belt and Puppia harness. He has a leash from Buddy Belts as well as another leash I picked up at PetValu. It never hurts to have more than one in case one breaks or is damaged. * We use a harness for safety reasons. In small dogs like Yorkies, it is safer to attach a leash or lead to a harness than a dog collar. If your dog pulls or the leash is yanked on their throat, it can cause damage to the trachea. * Retractable leashes are dangerous. Please do yourself and your pet a favour and don’t get a retractable leash. If you insist on having one NEVER allow a child to hold it. You can read more about this here (this is one of many links on the dangers of retractable leashes). I have a scar on my leg from one and I’ve seen a photo of someone’s fingers nearly amputated by one. A serious accident can happen to your or your pet so quickly when using one, it’s just not worth it. If we find we cannot help others, the least we can do is to desist from harming them.